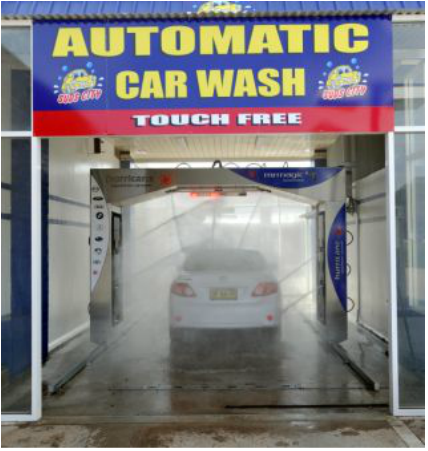 Welcome to Suds City Carwash Touch Free Automatic! Ultimate Wash - Prepped by our Friendly Efficient Staff & Front of Vehicle Debugged before leaving. Deluxe Wash - Two Rinse Cycles to wash Presoak off prior to our Supershield Wax being applied. Standard Wash - This wash can be used by people who like to wax their own vehicle as it doesn't include a wax. The degreaser is designed to help remove brake dust and oily build ups in the engine bay. For the best results apply and allow to sit (for up to a maximum of 2 minutes) before removing with high pressure soap and then high pressure rinse. Repeat the same process if required. Do not allow the products to dry. It is not recommended applying the degreaser to any part of the paint work as it can reduce the paints protection. The Pre-soak is applied under low pressure, and once applied will help loosen any road grime and bugs. For the best results apply the Pre-soak and allow to sit (for up to a maximum of 2 minutes) before using the High Pressure Soap to rinse. Do not allow the product to dry on the paint. High Pressure Soap will remove all the heavy contaminates like bugs, mud, and thick road grime. For the best results apply the High Pressure Soap and allow to sit (for up to a maximum of 2 minutes) before using the Foaming Brush. Do not allow the product to dry on the paint. The foaming brush will slowly pump foam from the head of the premium hogs hair brush and allowing you to gently wipe over your paint surface, this will remove what is left of those stubborn bugs and road grime. Do not allow the product to dry on the paint. 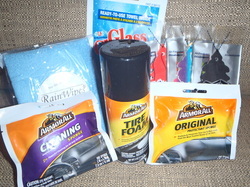 High pressure Rinse is used to remove all the previous soap products applied to the car. To remove the soap effectively, start rinsing from the top of the roof to the bottom of the car. Suds City does not recommend using the high pressure rinse as a final rinse as this will cause streaking. When applied evenly over the paint, the Clear Coat Protectant will restore your paints shine and help repel dust. Do not over apply the clear coat Protectant. Do not allow the product to dry. Spot Free is produced through a water filtration process called reverse osmosis, which removes molecules and ions from the water to produce pure uncontaminated water and therefore a spot free finish. This step should always be used as the final process. For the best results spot free rinse the car from the top of the roof to the bottom of the car. You will require a minimum of 3 minutes for the best finish. 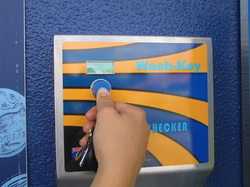 Suds City Corporate Wash Key is designed for our Business Customers. CONVENIENCE - No more searching for coins or tokens through your purse or vehicle. business Expense records and full Tax Deduction Benefits. 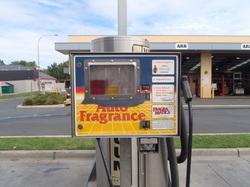 the Self Serve Bay or Vacuum or $12 into the Touch Free Auto. the Change Machine, the amount will display. SIMPLE TO RECHARGE - Ask our Friendly Attendant to Recharge your key. Payment by Cheque, Cash or EFT. Do you like having your windows, interior and tyres clean, shiny and refreshed? Vending Products are available 24 hours 7 days a week. Does your car have an odour? Or do you want to keep your car smelling new? hours 7 days a week and everyday of the year.